One of the more doable jobs in auto repair is that which involves the brakes. The brake rotor provides a friction surface for the brake pads. It is designed to dissipate the heat generated by friction during braking. The a bility of a brake rotor to properly disperse heat relates to the size of the brake rotor. The measurement of the thickness of the brake rotor is designed to provide the greatest heat dissipation possible. Machining the brake rotor below those specifications can cause excessive heat build-up during heavy braking. The brake rotor may have cooling fins set in the center to provide ventilation for improved heat dissipation. The surface of the brake rotor is machined to a smooth finish to provide better brake pad to rotor contact and to ensure more even braking. The brake rotor can be easily damaged by metal to metal contact from worn out brake pads. Scoring of the brake rotor surface below minimum thickness levels can quickly occur if the brake pads were worn down to the metal backing plate. Brake rotors can become distorted by improper tightening of the wheel mounting bolts. This can result in warped brake rotors and a pulsating brake pedal. For this reason, wheel mounting bolts should always be tightened to proper torque specifications. When diagnosing and troubleshooting a shaking front end while braking, always consider the possibility of warped brake rotors before engaging in an auto repair brake job. There are three types of disc brake calipers used in passenger cars and light trucks: fixed, sliding, and floating. The fixed caliper is the oldest design of brake caliper in use. They first started appearing on import and domestic performance vehicles in the 1960’s. Most vehicles today use the single piston sliding or floating caliper. Sliding and floating calipers are cheaper to manufacture and more simple in design than the fixed caliper. 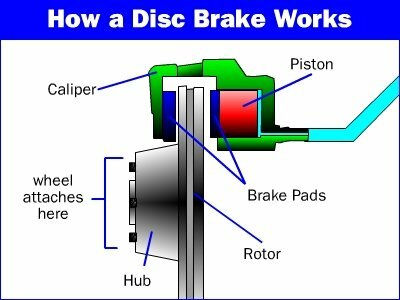 Basic disc brake caliper operation is accomplished by using hydraulic pressure to actuate the disc brake caliper piston. The caliper can contain up to four pistons, depending on the type used. Each piston is mounted in a bore machined into the caliper. A round, square cut, “O” ring seal is contained in a groove cut into the caliper bore and provides a seal for the caliper piston. A dust seal is placed around the lip of the caliper piston at the brake pad contact area and is secured in a groove on the outside of the caliper bore. A hydraulic seal is maintained through contact of the caliper piston surface with the caliper seal. The caliper seal also provides two other functions in the disc brake caliper. It acts as a brake return spring to maintain correct clearance between the brake pad and the rotor. The caliper seal is able to do this because of its placement in the groove cut in the caliper bore. The seal groove is cut slightly wider than the caliper seal. When the automotive brakes are applied, the piston slides forward in the bore, moving the caliper seal against the edge of the seal groove. This causes the seal to distort in the same direction as the movement of the piston. When the brakes are released, pressure is removed from the piston and the distortion of the caliper piston seal causes it to pull the piston back slightly and create a small amount of clearance between the brake pads and the rotor. This same design allows the piston to move slightly outward as the brake pads wear, when the brakes are applied, due to contact between the seal and the piston surface. When doing an auto repair job involving the brakes, make sure you take note of this very critical design feature. The fixed disc brake caliper uses pistons mounted in the caliper on both sides of the rotor. Hydraulic brake fluid is supplied to both pistons through passages bored inside the caliper. Pressure is applied directly to both brake pads by the reaction of the pistons to hydraulic pressure from the master cylinder. The sliding and floating disc brake calipers generally use one large piston for disc brake pad application. The piston is located on the inboard side of the caliper and directly applies pressure to the inboard brake pad. When the brakes are applied, hydraulic pressure forces the brake piston outward against the inboard pad. That same hydraulic pressure, also forces the caliper assembly in the opposite direction and because the caliper is allowed to float on pins or slide in the mounting bracket, the caliper will provide a clamping action for the outboard brake pad at the same time. This design will use a large piston to multiply the hydraulic force of the automotive master cylinder. 2 Comments on "Brake Rotor Caliper"
What type of grease should be used for caliper slide pins? I used one with lithium. I’m not sure because there are several different types, some with silicone. I read that petroleum containing grease should not be used.